Ford say their new Kuga is set to disapprove the myth that an SUV can’t be ‘green’, high-tech and capable all at the same time. And I think they may be right. The new Kuga is an impressive vehicle and delivers class-leading technology, fuel efficiency, safety, drive and comfort. For a mid-size SUV its engines will provide significant fuel efficiency improvements; reduce petrol fuel consumption by 25 per cent and diesel fuel consumption by 10 per cent. (If you fancy one of these, have a look at their EcoBoost engine which is seriously impressive). Ford have also introduced a segment-first hands-free tailgate, and the car debuts the firm’s global intelligent all-wheel-drive system and Curve Control. The Kuga is also the first Ford with enhanced Torque Vectoring Control which helps deliver best-in-class handling. As you’d expect, the Kuga has a five-star safety rating from Euro NCAP and Ford have also installed SYNC with Emergency Assistance and Active City Stop. In addition, new owners will find more space inside, a quieter cabin and rear seats that fold flat. One reason the Blue Oval has put so much into this new vehicle is their intention to expand aggressively into the SUV market, which is growing quickly in Europe. To that end, Ford will follow up their new Kuga with the modern and innovative EcoSport, which will mark the firm’s entry into the small SUV segment. After that we will see the Edge – a larger crossover that is a success in North America and other markets. 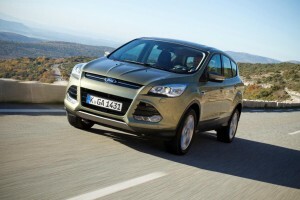 Though how it will fare in the UK remains to be seen (Ford hasn’t got the best reputation for bulding large SUVs). The new Kuga is meant to be a ‘global model’ so it’s the same wherever you buy one. This is a great idea but you usually lose something in trying to meet so many market demands – in this case it’s in the slightly bland design and the handling. Anyway, Ford have shifted 45,000 Kugas since they were launched in 2008 and hopes are high that this nifty motor will sell even more. From what I’ve seen there’s no reason doubt that. Available to order now, prices start at £20,895 OTR. This entry was posted in 4X4 Car, Car Updates & Releases, New Cars and tagged 2008, Active City Stop, Blue Oval, caption, car, Curve Control, EcoSport, Emergency Assistance, Euro NCAP, Europe, ford, Ford Kuga, fuel efficiency, GM, kuga, LS, MoT, New Ford, New Ford Kuga, North America, price, seat, Sport, SUV, SYNC, technology, Torque Vectoring Control, UK by Steve Lumley. Bookmark the permalink.